1. 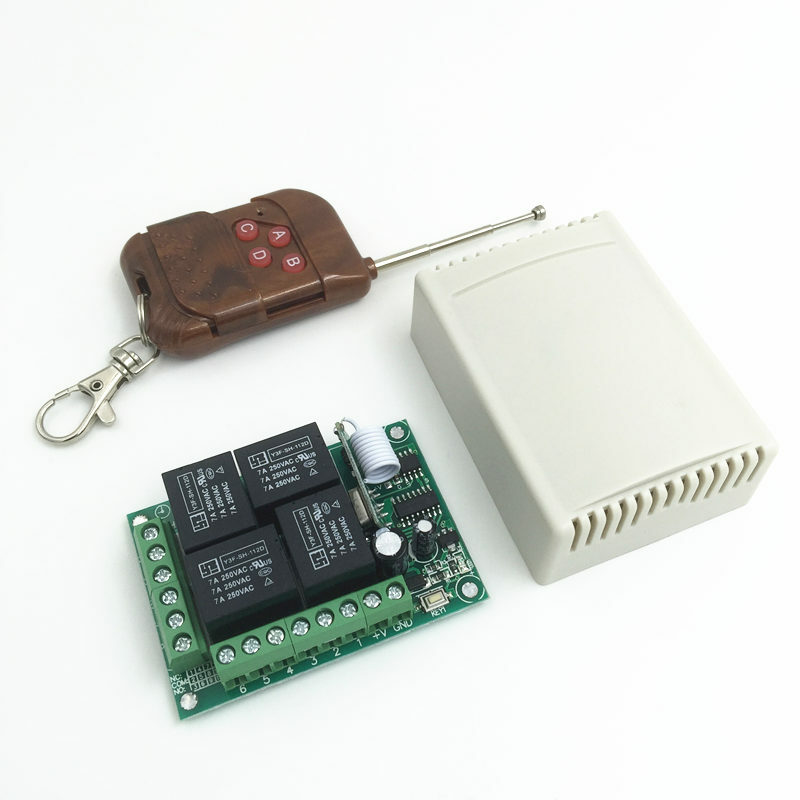 Momentary Mode: pressing one time the learning key button on the receiver board ( Led indicator on receiver board will signaling simultaneously ),then press any of the remote button , signaling three times by remote’s LED indicator informs about setting momentary mode successfully . 2. Toggle Mode: pressing two times the learning key button on the receiver board( Led indicator on receiver board will signaling simultaneously ),then press any of the remote button , signaling three times by remote’s LED indicator informs about setting toggle mode successfully . 3. Latching Mode:pressing three times the learning key button on the receiver board ( Led indicator on receiver board will signaling simultaneously ),then press first remote button ,follow on second remote button , signaling three times by remote’s LED indicator informs about setting latching mode successfully ( first button stands for on , second button stands for off ). 4. 2CH momentary + 2CH Toggle :pressing four times the learning key button on the receiver board(Led indicator on receiver board will signaling simultaneously ),then press any of the remote button , signaling three times by remote’s LED indicator informs about setting 5-second delay successfully . 5. 2CH Momentary + 2CH Latching :pressing five times the learning key button on the receiver board ( Led indicator on receiver board will signaling simultaneously ),then press any of the remote button , signaling three times by remote’s LED indicator informs about setting 10-second delay successfully . 6. 2CH Toggle + 2CH Latching :pressing six times the learning key button on the receiver board( Led indicator on receiver board will signaling simultaneously ),then press any of the remote button , signaling three times by remote’s LED indicator informs about setting 15-second delay successfully . 7. 2CH Latching + 2CH Latching :pressing seven times the learning key button on the receiver board( Led indicator on receiver board will signaling simultaneously ),then press any of the remote button , signaling three times by remote’s LED indicator informs about setting 15-second delay successfully . 8. 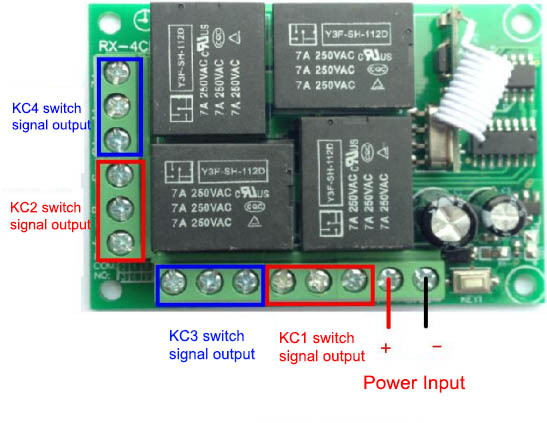 Deleting existing remote controls data: pressing eight times the learning key button on the receiver board , the LED indicator on receiver board will flash for eight times , the existing remote controls are deleted successfully . 1. 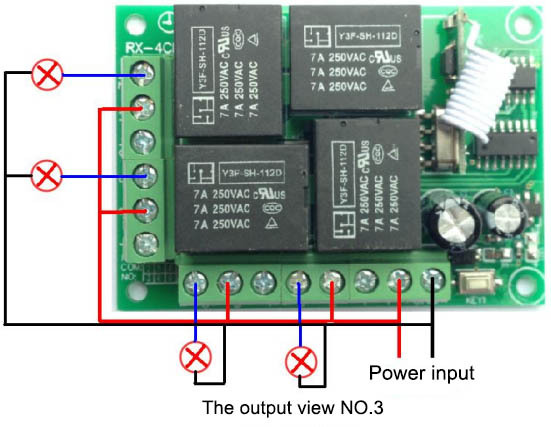 Please do not charged operation, you should shut off the power, and operation after testing and correct electricity. 3. 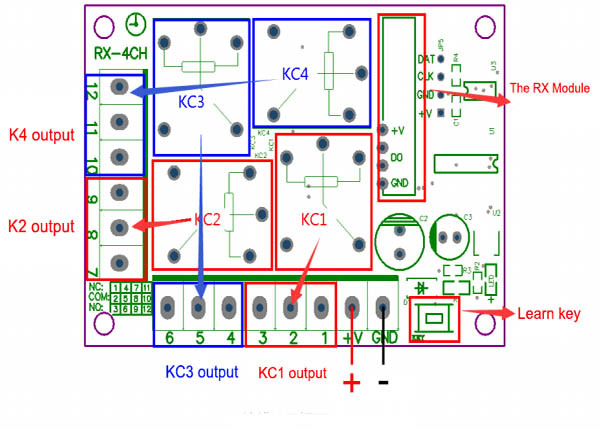 Please pay attention to avoid metal mask,large equipment ,strong interference electromagnetic filed when using wireless RF products,and avoid too short distance between the remote control and receiver board . 4. Please avoid abnormal using of the product.Abnormal using will reduce product performance and life, when seriously it may damage the products and even make danger for your safe .